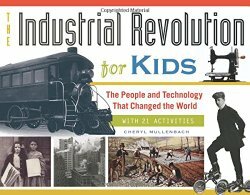 Have you seen the newest title in the Chicago Review Press For Kids series: The Industrial Revolution for Kids: The People and Technology That Changed the World, with 21 Activities by Cheryl Mullenbach? The Industrial Revolution is a tough time frame to teach to kids because so much was happening. Technology was changing, people were moving – both from rural areas to cities and through migration – and industries were starting to play a significant role. Mullenbach does a wonderful job of giving the big picture, while at the same time telling the stories of lesser-known individuals who younger readers will find especially relevant. She pulls no punches, revealing the hard times as well as the good things that came out of the era. As is usual for this series, the text is sprinkled with instructions for hands-on activities to reinforce learning. For example, Mullenbach suggestions looking into the tank of two toilets to see how many interchangeable parts there are, a feature developed during Industrial Revolution. Although adults might find the idea distasteful, the workings of the insides of a toilet tank can be fascinating to kids (Note: toilet tank lids can be heavy and are breakable if dropped). See Wrapped in Foil for a full review of the book and another activity suggestion.